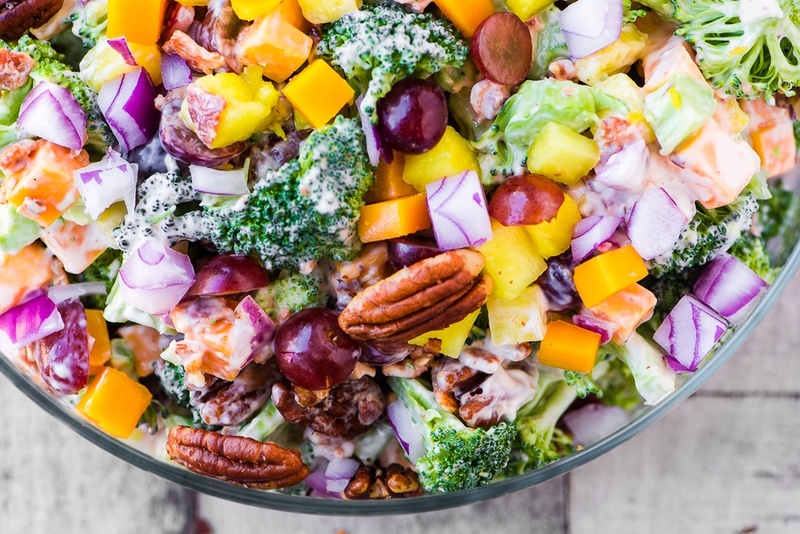 Broccoli Salad with Pineapple, Bacon, and Spiced Pecans ~ don't be surprised if everybody skips the main course and heads straight for this salad! 1 pound broccoli crowns, chopped into bite sized pieces, chop some of the stems, too! Line a baking sheet with foil and arrange the bacon strips in a single layer. Cook for 25 minutes, or until crisp. Reserve 3 tablespoons of the fat, and set aside the bacon to drain on paper towels, then chop or crumble. Put the pecan halves in a skillet over medium heat and toast, stirring almost constantly, for about 5 minutes, or until they give off an aroma and start to turn brown. Add the butter and the spice rub and continue to cook and stir for 2 minutes more. Set aside to cool. Put the broccoli, red onion, pineapple, grapes, and cheese in a large bowl. Add the bacon and the nuts. Toss the salad with the dressing, you may not need all of it. Cover and refrigerate until needed. Just before serving, toss the salad again, add more dressing if needed, and season with more salt and pepper if necessary.